Gonzaga loses! UCLA impresses! Villanova clinches! Saturday was quite a busy day in the college basketball world. How do all of those events impact the field of 68? A Moving Day on Saturday is typically associated with golf in the sports world, but this weekend that trickled over to the college basketball universe. If there’s one day in particular that turns out to be the most responsible for the makeup of, and seeding within, the 2017 NCAA tournament, Saturday, February 25, will be it. · Gonzaga’s bid for an undefeated season ended, with BYU pulling off a stunning upset in Spokane. The loss also put the Bulldogs’ hold on the No. 1 seed in the West Region in jeopardy. · Kansas and North Carolina cruised to wins over inferior opponents, while Villanova clinched the Big East regular season title outright with a win against Creighton. · UCLA earned its most impressive win of the season, knocking off Arizona in Tucson. The win essentially drew the Bruins even with the Wildcats and Oregon in the race for the No. 2 seed in the West Region, and possibly the top line out west should Gonzaga lose again. · Kentucky, playing without De’Aaron Fox, beat Florida at home, 76–66. The win placed the Wildcats all alone atop the SEC standings, and gave them a path to improve on the No. 3 seed granted to them by the committee in its midseason reveal earlier this month. · Baylor, which was a No. 1 seed in that same midseason reveal, lost for the fifth time in its last eight games, falling at Iowa State. With West Virginia on tap Monday, and the Big 12 tournament next week, the Bears’ slide down the bracket may not be over. · Speaking of the Cyclones, they were one of a handful of teams that all but punched at-large tickets on Saturday. They were joined by Michigan, which throttled Purdue, and Miami, which shut down a Grayson Allen-less Duke team, as the big mid-seed winners on Moving Day. All three should now feel safe on Selection Sunday. · Finally, it couldn’t be easy to break college basketball’s most notorious streak, right? Northwestern let a seven-point lead against Indiana with 1:33 left slip away, watching the Hoosiers go on an 8–0 run to close the game. The Wildcats have lost five of their last seven games, and finish the regular season at home with games against Michigan and Purdue. So, yeah, you could say it was a busy day across the NCAA tournament landscape. How did all of that, as well as the 25 or so other games with tournament implications, affect the field of 68? We present that below in the Bracket Watch, updated for February 26. One week ago, UCLA was a No. 4 seed, running third in the Pac-12 behind Oregon and Arizona. How did the Bruins jump to a No. 2 seed, leapfrogging the Wildcats in the process? Well, of course, it wouldn’t have been possible without their dramatic win in Tucson over the weekend. While the Bruins are still 1.5 games behind Oregon and Arizona in the Pac-12 standings, the win likely brought the teams level in the eyes of the selection committee. UCLA went 2-2 against the other two, while Oregon went 2-1 and Arizona went 1-2 (the Ducks and Wildcats played each other only once). That brings us to the overall resumes, where a clear-eyed comparison favors UCLA over Arizona. The Bruins are ranked 13th on kenpom.com and 15th in the RPI. The Wildcats are 23rd on kenpom.com and ninth in the RPI. We can call that effectively a wash. Where the Bruins start to separate themselves is in the quantity and quality of their best wins. They are 3-2 against the RPI top 25 and 5-3 against the top 50. In addition to beating Arizona on the road and Oregon at home, UCLA took down Kentucky in Lexington. The Wildcats, meanwhile, are 1-4 against the top 25 and 4-4 against the top 50. After their road win over the Bruins, their next best win came at USC. The Trojans will likely make the NCAA tournament, but that doesn’t measure up to UCLA’s second-, third-, or maybe even fourth-best win (Michigan). It isn’t often that a team jumps two lines with one win, but UCLA’s victory in Tucson on Saturday vaulted them in front of Arizona. That pushes them all the way up to the 2-line, and knocks the Wildcats down to a No. 3 seed. We’re going to reach all the way down to the No. 9 seed in this region in an effort to quell the fears of the nation’s most anxious fan base. It has been ugly recently, Northwestern fans. But you don’t need to worry too much. At least not yet. Yes, Saturday’s loss to Indiana was bad. After allowing the Hoosiers to close the first half on a 22-0 run, the Wildcats came out firing in the second half, erasing a 10-point deficit in just more than six minutes. With 1:33 left in the game, Northwestern led by seven and appeared on its way to the final win that many believe will lock up the first ever trip to the NCAA tournament in school history. The Hoosiers would go onto score the final eight points of the game, keeping their fledgling tournament hopes alive with a 63-62 win while simultaneously increasing the collective blood pressure in Evanston, Ill., a few notches. The Wildcats have now lost five of their last seven games, jeopardizing what just a couple weeks ago appeared to be a likely tournament bid. Let’s take a step back, however, and look at Northwestern’s entire body of work. The Wildcats have three top-50 wins, including a road victory at Wisconsin. They also beat Dayton, which is all but assured of a trip to the dance, on a neutral floor. They don’t have a loss outside the RPI top 100, with their three worst losses coming to Illinois (twice) and Indiana. The Wildcats are ranked 50th in RPI and 36th on kenpom.com. That isn’t the resume of a tournament lock, but it is one likely to earn a bid, especially in this year’s bubble climate. No matter what, there will be 68 teams in the field when the bracket is unveiled on Selection Sunday. For now, Northwestern is still on track to earn one of those spots. They could remove any doubt with a win over Michigan or Purdue at home this week. Take a look at the teams in our South Region. Would you care to guess which one has the most RPI top-50 wins? Obviously it’s No. 1 seed North Carolina, right? Nope, it’s No. 3 seed Butler, which is 10-2 against the top 50, giving the Bulldogs one more top-50 win than the Tar Heels. 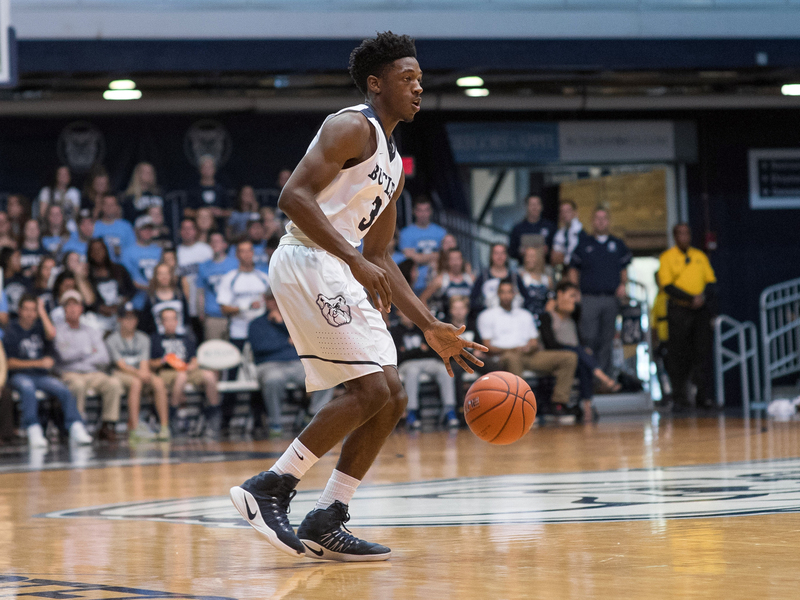 Six of those wins for Butler came against top-25 teams, including a sweep of Villanova. Butler is the best team no one is talking about as a Final Four contender. The Bulldogs head into the final week of the regular season on a four-game winning streak, coming off their best week of the season. They spent it on the road, first completing that season sweep of Villanova with a 74-66 win in Philadelphia. After a few days off, they went into Cincinnati and swept Xavier, racking up 88 points on 54.8% shooting from the floor. If the Bulldogs are going to get back to the Final Four for the first time since the days of Gordon Hayward, Shelvin Mack and Brad Stevens, it will be that offense that takes them there. Butler ranks 16th in the country in kenpom.com’s adjusted offensive efficiency. The Bulldogs are 28th in effective field goal percentage, 26th in two-point percentage, and 10th in turnover percentage. In other words, the Bulldogs regularly get good shots, they convert those shots at a high rate, and they rarely turn the ball over. That’s usually a successful formula for creating a great offense. The Bulldogs likely can’t climb up to the top line, but a No. 2 seed is firmly in their sights. No matter where they end up in the bracket, though, they’re going to be a threat to get all the way to Houston. Gonzaga’s loss to BYU was the biggest story in a loaded weekend. We kept the Bulldogs on the top line in the West, but dropped them to the No. 4 overall seed. The question for the Bulldogs now is can they remain a No. 1 seed with another loss? First, let’s dispel the notion that Gonzaga coasted to a top seed and the No. 1 spot in the polls because of a bad West Coast Conference. It’s true that the WCC will stigmatize Gonzaga’s success for many in the college basketball universe. That’s a reality the Bulldogs can only combat when they get out of conference, and they did that with aplomb this season. They beat Arizona, Florida and Iowa State on neutral floors, giving them two top-20 wins, and another top-40 victory. They also swept Saint Mary’s, which is 19th in the RPI and a guaranteed tournament team. The Bulldogs were, and still are, worthy of their national championship contender status. Yet, two losses in the WCC will likely be too much for them to overcome, in terms of being a top seed. Oregon, Arizona and UCLA are all laying in wait for the top seed in the West Region. Should Gonzaga lose another game, the best team in the Pac-12 will likely have a better resume, in the eyes of the selection committee. Remember, the Bulldogs were the No. 4 overall seed in the committee’s midseason reveal, and while they won four games since then, including at Saint Mary’s, the loss to BYU could have counterbalanced all of that. Oregon is a win at lowly Oregon State away from at least a share of the Pac-12 regular season title. If they get that and win the Pac-12 tournament, and Gonzaga loses in the WCC tournament, it would be hard for the committee to keep the Ducks off the top line. The same goes for Arizona, which will earn at least a share of the Pac-12 regular season championship with a win at Arizona State this week. Even after the loss to BYU, Gonzaga remains the favorite to lead the West Region. But they no longer have any margin for error.